I agree that anthracite maple is indeed nice. It's not my favorite finish, but it's up there. It does look especially good with two-tone interiors like the Champagne leather seats or the Truffle Brown setup. Another nice thing about it is that it is quite rare. Of the 11 different finishes that BMW offered for the X5 trim I think it's probably among the nicest 3. Can anyone give an opinion on the 4.8is' Comfort vs Sport seats? Comfort is common while sport is rare when i look at 4.8's, so which is worth it? Whichever one suits your needs best. If the comfort seats feel better to you, get them. Sit and drive with both (sport bolsters will hug you in turns more remember) and see. Don't buy the car based on which seats make it more valuable, buy the car with the seats that feel better to you. Our sponsors ECS Tuning will give you a good price. Click there banner on top right. Check vendors forum. Be careful as there are two finishes that look similar but are not. Titanium and Metallic Graphite. If you decide to buy one make sure it is the right one you are looking at. 4.8bro can you snap some shot of your dark walnut finish? I have either the titanium finish or the graphite and not so found of it myself. I'd be willing to do a swap or even buy yours if it's in perfect shape. I'll snap photo's of my interior too. You can see just about all the finishes by looking at X5's on ebay. Note there is no "dark walnut." There is a Dark Poplar and a Smoke Grey poplar (aka Anthracite Maple). Last edited by X5 Meister; 04-18-2010 at 04:43 PM. Thanks for the heads up X5 Meister. I never use ebay so I forget about using it as a tool. It looks like I need to proof read my post and correct spelling errors too! 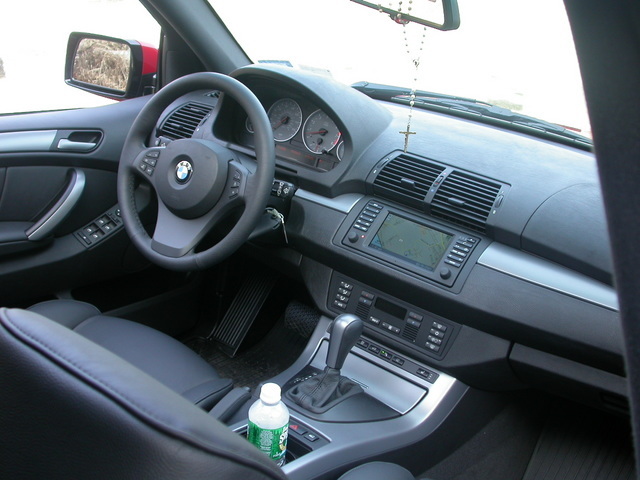 Here are photographs of my interior trim. It must be Graphite as I'd expect Titanium to be brighter still. I'll keep searching ebay for other options. Graphite trim is same color as the door handles on 4.8is. 4.8is was offered in graphite and not titanium.